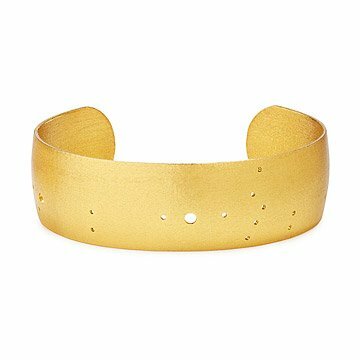 Julie Nolan's mythical cuff charts your birth month constellation in solid brass plated and shimmering gold. Handmade by artist Julie Nolan, each mythical cuff charts your birth month constellation in solid brass plated with shimmering gold. Inspired by a turn-of-the-century Swiss astrology calendar, Julie hand-stamps constellations into elegant patterns that span the width of each piece. The larger openings represent the brightest stars shining in the sky. Handmade in Massachusetts. See Julie Nolan's matching Gold Astrology Locket. Wearing this bracelet for the first time today and I love it. It is lightweight and comfortable. I have small wrists and it fits nicely after a gentle bend. I have already received numerous comments due to its beautiful unique luster. I bought two of them (my astrology & my significant other) to wear whenever. Thanks to the artist that thought of them...fun to wear! I bought the brass version of this cuff last year and my sister has been admiring it ever since, so I bought her this gold version for her birthday. The gold is even more stunning in real life than the picture. She LOVES it and she gets compliments every day.